It is simply amazing what incredible result our simple prayers can produce. We need nothing but a sincere cry from our heart. Let me share a recent experience. I was fortunate to get the association of a very senior devotee sometime back. After meeting this devotee a couple of times my heart longed to get some opportunity to serve this amazing devotee. There didn’t seem to be any chance for me as the needs of this particular devotee are very few and on top of that this devotee is being served very well by a set of senior devotees. Still, I would pray regularly for some chance of service. Few days back, after some gap, I again got an opportunity to meet this devotee. Before leaving home I prayed with all my heart in front of my altar, begging Lord to grant me some opportunity to serve this amazing devotee. I have Jagannath and Gopal deities at home and I literally rubbed my nose on the ground praying to Them. The chances, as I mentioned, were bleak if not nil, still the desire in my heart to serve this devotee remained very strong, in fact it only grew stronger with the passage of time. So I met this devotee and after our meeting was over, this devotee asked a senior devotee and myself to stay back for 5 minutes. As everyone left and the words came out of the mouth this devotee my jaw dropped! I was getting a service!! And that too a service which I could not even dream about! This devotee was observing my face and asked me why I suddenly have this strange look on my face. I shared how I have been praying to get some service and today I prayed with a little more heart and here I am receiving one! It was nothing short of a miracle for me. I was over the moon, I thought I had suddenly developed two wings! The point I wish to emphasize here is that our prayers to Lord have huge potency. The power is not in us but it is in the prayer itself. So many times we hear devotees say ‘Prabhuji please pray for me’, the point is how much we are praying for our own self? We should not think that other devotee’s prayers have more power ( they have their own place) so let me request others where as Krishna will not hear my own prayers. This is not the case. It doesn’t matter whether we are a neophyte or a senior devotee, initiated or not initiated, what matters is the sincerity of our prayer. Looking at my own self I would even dare add that even a contaminated heart is no disqualification, rather by the mercy of Gaura Nitai, this very disqualification has become our qualification to seek mercy from the Supreme Lord. I will share another experience. During the recent Kartik, at one of the home programs I would stress the need to pray almost in every single class. Then after Kartik I requested all the devotees to share their experience of Kartik. One devotee, who attends all the classes diligently, shared how his chanting actually went down during this period, I was very surprised. Then I asked the Prabhuji did he pray before or even during the Kartik to help him chant better or help him overcome whatever challenge he was facing due to which he could not get time to chant, the reply … No. This is our condition, rather this is my own condition, and not some just some ordinary condition but an unfortunate condition. Lord, and His devotees, have given us so many ways to approach and seek help yet I am so unfortunate that I do not have time to pray and seek their intervention. Actually my condition is very fortunate because having come into Krishna consciousness there are so many means and methods but I am myself making my condition unfortunate by ignoring most of them. As I looked back I could suddenly see so many means by which Krishna, and His devotees, are willing to help me but I am so unfortunate that I am completely blind to them. In my case, many a times, I am even uttering these prayers or verses but with no understanding or heart in it, this is my ‘durdaivam’. I am copying some examples, which come to my mind right now, and the benedictions associated with them in Q&A format, along with the reference, from which everyone take benefit. 1. 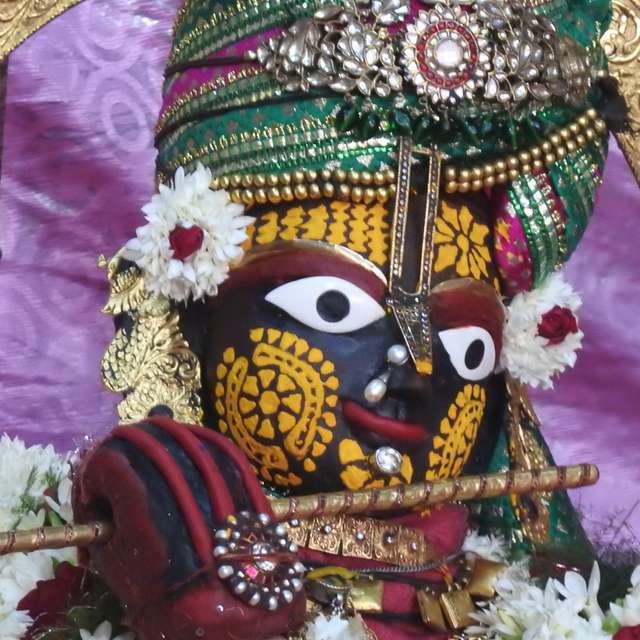 Do I have a desire to attain eternal residence in Vrindavan? 2. Do I have a desire to realise what is Love of God? Read chapter 23 of CC Madhya lila regularly. 3. Am I facing obstacles on the path of bhakti? Take shelter of the six goswamis (and by sincerely reading Sri Shad Gosvamy Ashtaka daily). 4. Do I have a sincere desire to understand the confidential truth of Sri Caitnaya Mahaprabhu? Read chapter 8 of CC madhya lila regularly. The author requests every reader to hear these talks with faith and without argument. By studying them in this way, one will be able to understand the confidential truth of Śrī Caitanya Mahāprabhu. 5. Do I even have a remote desire to one day serve Sri Radha Krishna directly? I am sure that there are hundreds of others benedictions given by our acharayas which may be relevant to us at different stages of our spiritual journey. What is really needed for us is to sincerely seek them, understand their essence by carefully studying them (by always taking shelter of a senior devotee) and finally serve these prayers by reciting them sincerely from our heart. 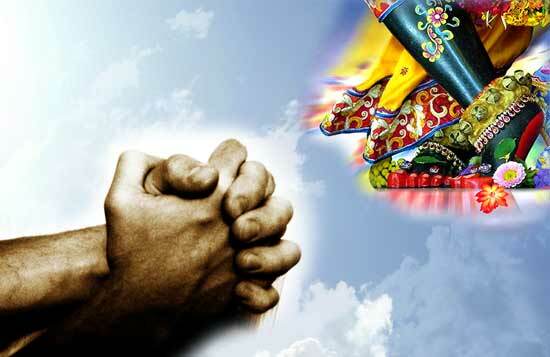 As an aspiring devotee it will be very beneficial for us if we inculcate a prayerful mood. It will produce miraculous results. All glories to Guru and Gauranga. Should devotee chant any other mantra? Here is another wonderful conversation where Srila Prabhupada shares so many wonderful gems. Jayadvaita: Just like sometimes we’ll hear our men. They’ll be chanting… Like yesterday I heard someone was chanting “Nitai-Gaura, Nitai-Gaura, Nitai-Nitai-Gaura.” Like that, I’ll hear different mantras. Someone is chanting ‘Radhe, Radhe, Radhe, Radhe.” like that, at kirtana. Prabhupada: Well, that is not done by the acaryas. But there is no harm chanting “Radhe.” But sometimes it is degraded to make something new, invention. Therefore better to stick to “Hare Krsna” and to “Sri-Krsna Caitanya Prabhupada-Nityananda.” Otherwise… Just like the sahajiyas, they have invented: “Nitai-Gaura Radhe Syama, Hare Krsna Hare Rama.” These things will come gradually. But they are not approved. They are called chara kirtana (? ), means “concocted kirtana.” But there is no harm chanting “Radhe, Nitai-Gaura.” So better stick to this Panca-tattva, and maha-mantra. Just like “Nitai Gaura Radhe Syama, Hare Krsna Hare Rama.” There is “Nitai-Gaura, Radhe Syama,” but it is not approved. Mahajano yena gatah sa panthah [Cc. Madhya 17.186]. We have to follow the mahajana. In Caitanya-caritamrta you’ll find “Sri-Krsna-Caitanya Prabhu-Nityananda, Sri-Advaita Gadadhara…,” never “Nitai Gaura, Radhe Syama.” So why should we do that? 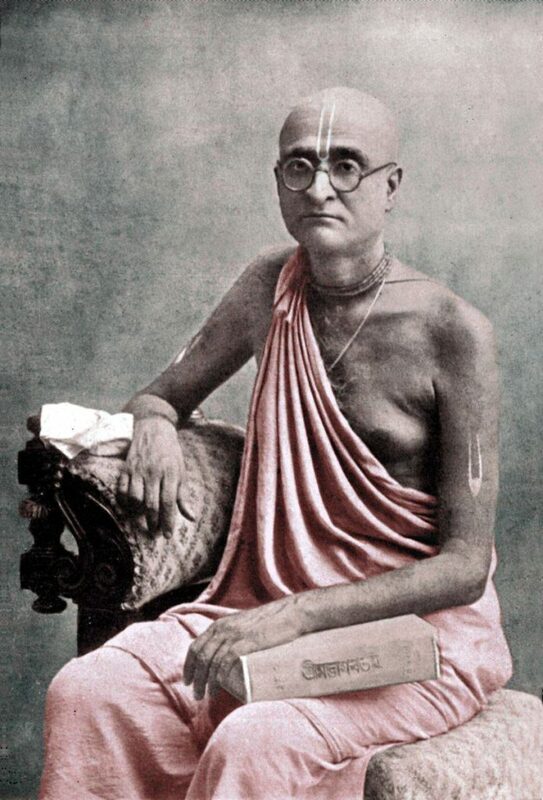 Jayapataka: The concocter of the “Nitai Gaura Radhe Syama,” previously he was a follower of Bhaktisiddhanta, but then he was rejected, and then he started his own camp. Prabhupada: No, yes, he was meeting Bhaktivinoda Thakura. So… What is called? Carana dasa Babaji. Satsvarupa: Srila Prabhupada, sometimes during arati, many bona fide bhajanas are sung, but not much Hare Krsna. Is that not a good tendency, that maybe just two or three minutes of Hare Krsna mantra and many other bhajanas? 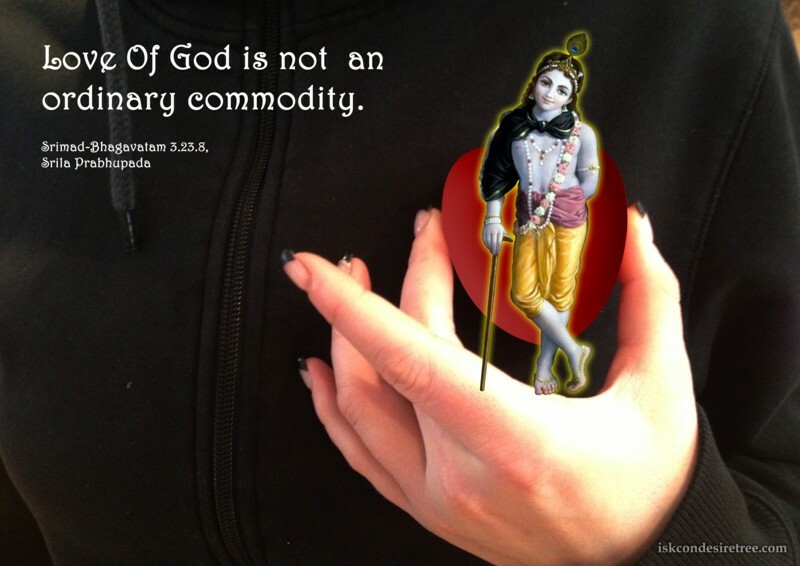 Jayapataka: …you say is back to Godhead. But when one is situated in pure, transcendental love of Krsna, then that’s, then wherever he may be, that’s back to Godhead. Isn’t it? Jayapataka: So then we should desire not to go back to Vaikuntha but to go back to…, to be situated in our pure service to Krsna. Prabhupada: So his representatives are there, the president, the GBC. They will see. Jayadvaita: The representative may be there, but what is my personal relationship? Prabhupada: Hm? To obey your spiritual master. Whatever he has said, you follow strictly. Follow the regulative principles. Chant sixteen rounds. That’s all. Prabhupada: That is always the position of spiritual master, to find out the deficiency in the character of his disciple. Prabhupada: Yes. He… He pointed out the deficiency, that “You have not described so elaborately about the Supreme Personality of Godhead. You have touched only the social, religious, political point of views.” That was his deficiency. So a disciple is always in deficiency before his spiritual master. Just like Caitanya Mahaprabhu says, guru more murkha dekhi karila sasana [Cc. Adi 7.71]. “My spiritual master saw Me a fool number one. Therefore he has chastised Me.” So disciple should be always ready to be chastised. He should not think that he has become perfect. That is perfection. So long he thinks that he is not perfect-he’s to be chastised — then he’s perfect. And as soon as he thinks that he has become perfect, he’s nonsense immediately, nonsense number one. [Break] …always to be chastised by the spiritual master for perfection. And if he thinks that now he has become perfect, then he’s a foolish. 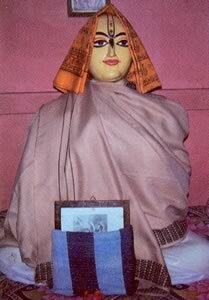 Caitanya Mahaprabhu said, guru more murkha dekhi. “My spiritual master saw Me a fool number one.” Was He fool number one? He’s God Himself. But that is the position. He should remain always a fool number one, ready to be chastised. Then he’s perfect. In the moral instruction, Canakya Pandita gives this instruction, that lalane bahavo dosas tadane bahavo gunah: “If you chastise your son or disciple, he’ll improve, and if you say, ‘Oh, you are all right,’ then he’ll degrade.” Tasmat putram ca sisyam ca tadayet na tu lalayet: “Therefore you always chastise your son and disciple. Never flat…” What is called? Satsvarupa: Prabhupada, in one purport in the Bhagavad-gita, you write that a disciple of a bona fide spiritual master is supposed to know everything. Prabhupada: Yes, if he follows the spiritual master. Satsvarupa: But how could he know…? What does that mean, “everything”? Prabhupada: Everything means whatever his guru knows, he should know, that much. Not like God, everything. Within his limit, that’s all. If he tries to understand whatever his guru has said, that much is “everything.” Otherwise, “everything” does not mean that we know everything, like God, like Krsna. That is not possible. If he regularly chants and follow the regulative principles, follows the orders of guru, then he knows everything. That’s all. Not very much… Knows everything, then what is the use of reading books when he knows everything? [break] …everything — except Krsna. Aham… Sarvasya caham hrdi sannivisto [Bg. 15.15]. He knows past, present, future, everything. You cannot expect anyone to know like Krsna, everything. Jayadvaita: Krsna says in Bhagavad-gita that one who knows Him knows everything. Prabhupada: Yes. Because if he knows that Krsna is the Supreme Personality of Godhead, then he knows everything. That’s all. Not that he should know as Krsna. If he… Yasmin vijnate sarvam eva vijnatam… If he accepts Krsna, the Supreme Personality of Godhead, the Absolute Truth, then he knows everything. That is finish. Jayadvaita: That knowledge itself is complete. Satsvarupa: There may be material things he doesn’t know, but they’re useless. Satsvarupa: If there’s some material information that such a person doesn’t know, that’s not really knowledge anyway. Prabhupada: I did not follow. Jayadvaita: Just like Gaura-kisora could not write. So it appeared that he did not, there was something that he did not know, although he knew Krsna. Prabhupada: Yes. He knows everything. Otherwise how Bhaktisiddhanta accepted him as guru? He knows Krsna. That’s all. Nalini-kanta: Whatever the spiritual master says, that is also perfect? Prabhupada: Yes. Because he says nothing concocted. Whatever he says, he says from sastra, and guru. Devotee (2): Srila Prabhupada, is there any instance when you were chastised by your spiritual master? Devotee (2): Is there any instance when you were chastised by your spiritual master? Prabhupada: Oh, yes. Oh, yes. Devotee (2): Can you tell us? Prabhupada: I remember the moment was very valuable. Yes. Devotee (2): Can you tell us the story? Prabhupada: Yes. I think I have said that. Prabhupada: Yes. He became very angry and chastised me. Jagajivana: Srila Prabhupada, was this during a lecture by Srila Bhaktisiddhanta? Jagajivana: Was this during a lecture? Prabhupada: Yes. I was not… One of my old brother, he, he wanted to speak something. So I leaned my… I immediately became… (laughter) So he chastised him more than me. Devotee (2): When Lord Caitanya chastised someone more than Advaita Acarya, Advaita felt that He had been neglected ’cause he had not received a greater chastisement. Yesterday, 8th August, was the day when ISKCON was incorporated ISKCON. I copying an article from Back To Godhead Magazine. Kindly read the same and get a sense of what Srila Prabhupada was about to do and from what humble begining, as a general of Mahaprabhu. We should all come together to nurture this Kalpataru, the ‘wish–fulfilling tree’ , called ISKCON and broadcast the teachings of Mahaprabhu in every single town and village of the world. 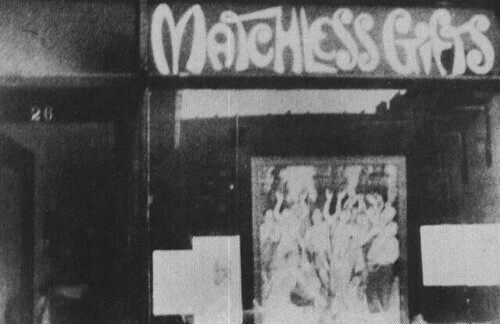 July, 1966 : Amid the cacophony of a storefront at 26 Second Avenue in New York, Srila Prabhupada had begun teaching the science of Krsna consciousness to a motley congregation drawn from the local community. Then, in his characteristically farseeing way, he founded the International Society for Krishna Consciousness. “We shall call our society ‘ISKCON.’ ” Prabhupada laughed playfully when he first coined the acronym. He had initiated the legal work of incorporation that spring, while still living on the Bowery. 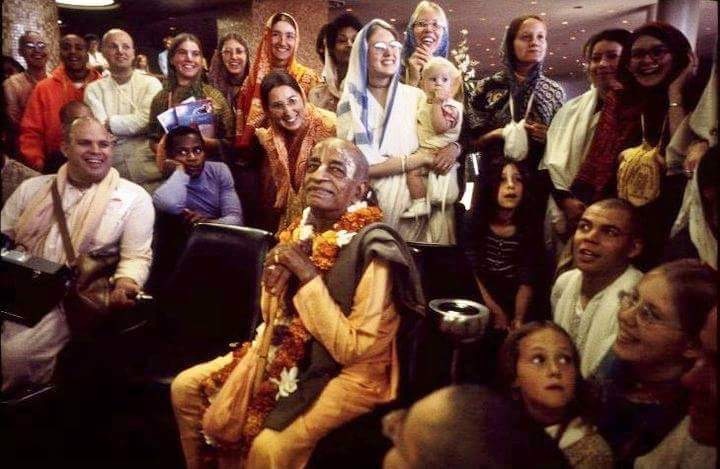 But even before its legal beginning, Prabhupada had been talking about his “International Society for Krishna Consciousness,” and so it had appeared in letters to India and in The Village Voice. Stephen Goldsmith had a wife and two children and an office on Park Avenue, yet he maintained an interest in spirituality. When Carl told him about Prabhupada’s plans, he was immediately fascinated by the idea of setting up a religious corporation for an Indian swami. He visited Prabhupada at 26 Second Avenue, and they discussed incorporation, tax exemption, Prabhupada’s immigration status—and Krsna consciousness. Mr. Goldsmith visited Prabhupada several times. Once he brought his children, who liked the “soup” Prabhupada cooked. He began attending the evening lectures, where he was often the only non-hippie member of the congregation. One evening, having completed all the legal groundwork and being ready to complete the procedures for incorporation, Mr. Goldsmith came to Prabhupada’s lecture and kirtana to get signatures from the trustees for the new society. “I will give you a practical example of how things are misinterpreted. Just like our president, Mr. Goldsmith, he knows that expert lawyers, by interpretation, can do so many things. Mr. Goldsmith stands, and to the surprise of the people gathered, he makes a short announcement asking for signers on an incorporation document for the Swami’s new religious movement. Prabhupada: Yes, you can. Bill, you can give your address. And Raphael, you can give yours. And Don…. Raymond. … Mr. Greene. The lawyer meets his quota of signers, but they’re merely a handful of sympathizers who feel enough reverence toward the Swami to want to help him. The first trustees, who will hold office for a year, “until the first annual meeting of the corporation,” are Michael Grant (who puts down his name and address without reading the document), Mike’s girlfriend Jan, and James Greene. No one seriously intends to undertake any formal duties as trustee of the religious society, but they are happy to help the Swami by signing his fledgling society into legal existence. No one knows exactly what the half-dozen legal-sized typed pages mean, except that “Swamiji is forming a society.” Why? But these purposes hardly seem urgent or even relevant to the present situation in the little storefront. Who’s going to make donations? Except maybe for Mr. Goldsmith, who has any money? But Prabhupada is planning for the future, and he’s planning for much more than just tax exemptions. He is trying to serve his spiritual predecessors and fulfill the scriptural prediction of a spiritual movement that is to flourish for ten thousand years in the midst of the Age of Kali. The Vedas describe that the time of the universe revolves through a cycle of four “seasons,” or yugas, and Kali-yuga is the worst of times, in which all spiritual qualities of men diminish, until humanity is finally reduced to a bestial civilization devoid of human decency. Somehow, he doesn’t see his extremely reduced present situation as a deterrent from the greater scope of his divine mission. He knows that everything depends on Krsna, so whether he succeeds or fails is all up to the Supreme. He has only to try. The purposes stated within ISKCON’s articles of incorporation reveal Prabhupada’s thinking. They are seven points; similar to those given in the Prospectus for the League of Devotees he had formed in Jhansi, India, in 1953. That attempt had been unsuccessful, yet his purposes remained unchanged. To propagate a consciousness of Krishna, as it is revealed in the Bhagavad-gita and Srimad-Bhagavatam. To bring the members of the Society together with each other and nearer to Krsna, the prime entity, and thus to develop the idea within the members and humanity at large that each soul is part and parcel of the quality of Godhead (Krsna). To teach and encourage the sankirtana movement, congregational chanting of the holy name of God as revealed in the teachings of Lord Sri Caitanya Mahaprabhu. To erect for the members and for society at large a holy place of transcendental pastimes dedicated to the Personality of Krsna. Reardless of how ISKCON’s charter members regarded the Society’s purposes, Srila Prabhupada saw them as imminent realities. The first purpose mentioned in the charter was propagation. “Preaching” was the word Prabhupada most often used. For him, preaching had a much broader significance than mere sermonizing. Preaching meant glorious, selfless adventures on behalf of the Supreme Lord. 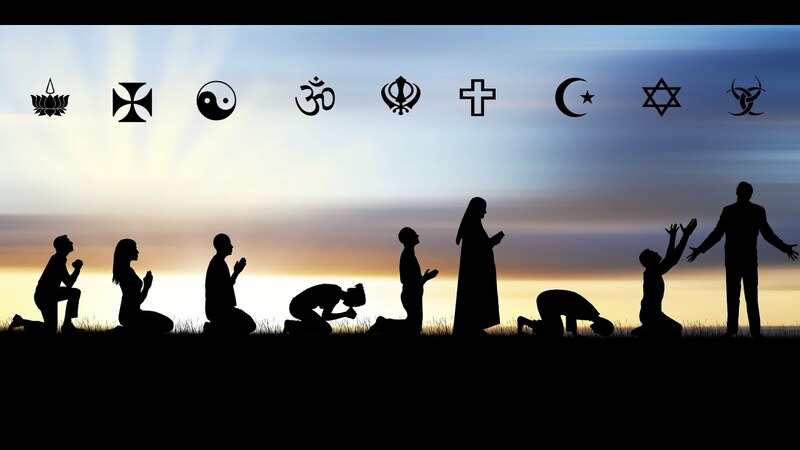 ISKCON’s preaching would achieve what the League of Nations and the United Nations had failed to achieve—”real unity and peace in the world.” ISKCON workers would bring peace to a world deeply afflicted by materialism and strife. They would “systematically propagate spiritual knowledge,” knowledge of the nonsectarian science of God. It was not that a new religion was being born in July of 1966; rather, the eternal preaching of Godhead, known as sankirtana, was being transported from East to West. The Society’s members would come together, and by hearing the philosophy of Krsna consciousness and chanting the Hare Krsna mantra in mutual association they would realize that each was a spirit soul, eternally related to Krsna, the Supreme Personality of Godhead. They would then preach these realizations to “humanity at large,” especially through sankirtana, the chanting of the holy name of God. He wanted ISKCON to demonstrate “a simple, more natural way of life.” Such a life (Prabhupada thought of the villages of India, where people lived just as Krsna had lived) was most conducive to developing Krsna consciousness. Certainly none of the signers saw any immediate shape to Prabhupada’s dream, yet these seven purposes were not simply theistic rhetoric invented to convince a few New York State government officials. He literally meant to enact every item in the charter. Of course, he was now working in extremely limited circumstances. The sole headquarters for the International Society for Krishna Consciousness was “the principal place of worship, located at 26 Second Avenue in the city, county, and state of New York.” Yet Prabhupada insisted that he was not living at 26 Second Avenue, New York City. “Society at large” could come here; the whole world could take shelter here, regardless of race or religion. Plain, small, and impoverished as it was, Prabhupada regarded the storefront as “a holy place of transcendental pastimes, dedicated to the Personality of Krsna:” It was a world headquarters, a publishing house. a sacred place of pilgrimage, and a center from which an army of devotees could issue forth and chant the holy names of God in all the streets in the world.